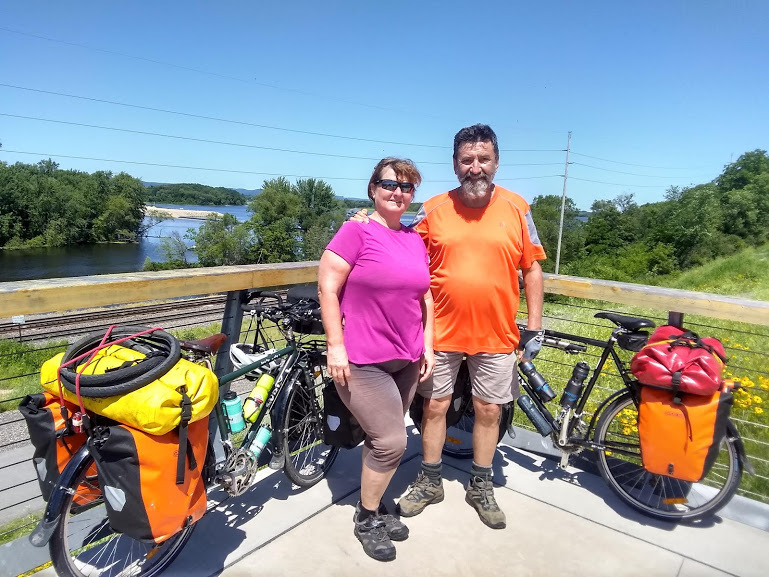 This morning we left McGregor and crossed the mighty Mississippi for the second time, stopping at the Visitor’s Centre in Prairie Du Chien on the other side. We are now in Wisconsin and still headed north. The Visitor’s Centre wasn’t much help with info about road conditions and shoulder widths, we really didn’t expect them to be though, but it was worth a try. As mentioned previously, we chose to ride Highway 35, The Great River Road, on this side of the river because it was allegedly flatter and safer. Although not entirely flat, it proved to be a lot easier on the legs than the previous week had been in Iowa. As for safer, well, the first 16kms out of Prairie du Chien were pretty crazy. The road was very busy with a lot of truck traffic and a small shoulder which tended to disappear on bends, being replaced by a concrete barrier that was meant to stop landslides. So, on the bends, we were not only unsighted, but we had to ride hard up against the barrier in a drain loaded with all kinds of debris from trees and traffic. To say we were having second thoughts would be an understatement! It was just another one of those times when you just have to grit your teeth and put a lot of trust in the drivers. Fortunately, it got better. The traffic thinned out a bit and the shoulder widened for us. At Lynxville, we stopped for a hotdog on the side of the road at The Dawg House. Some people stopped to chat and ask us about our trip. They told us the road would be pretty good from now on with a wide shoulder. That was good news as the hotdog went down. The road hugged the riverbank all the way, providing us with some great views of the mighty river and its steep, sandstone cliffs on the far side. It seemed we had made the correct decision after all. In Ferryville, we were greeted with a giant “Cheese” sign. Apparently, cheese is a thing here in Wisconsin. We stopped and got some cold drinks and something to eat before moving on. 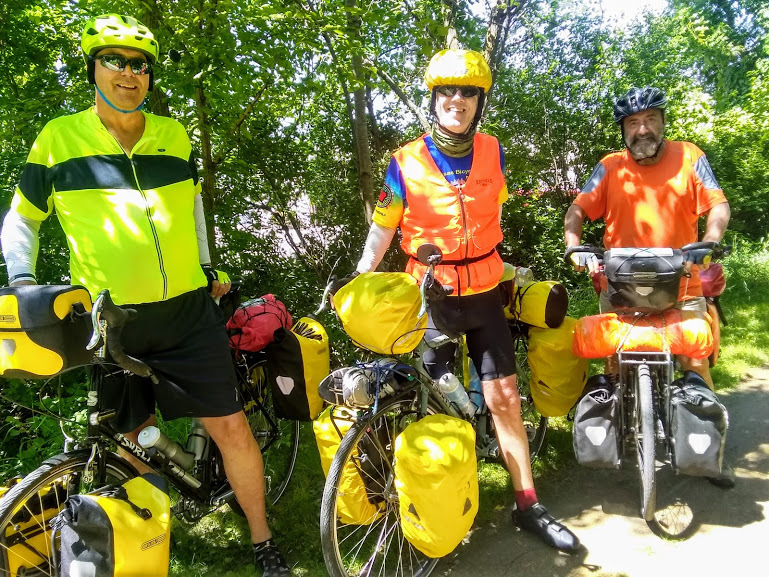 Another cyclist we met informed us that the road was good all the way up to the La Crosse, although we would only be going to Stoddard today. It had been a long day, in fact, our longest, all 85kms of it. We were pretty tired by the time we reached Stoddard, so we stopped at the Hood Scoops Ice Cream shop for a root beer float and a cold drink while Sharyn found somewhere to stay. The Water’s Edge Campground was (as its name suggests) right on the river and in town. While checking in I met a young Amish guy who was bringing supplies to the shop with his horse and cart. We chatted for a while, but his knowledge of almost anything not to do with the area and his kind was very limited. He hadn’t even heard of Australia! 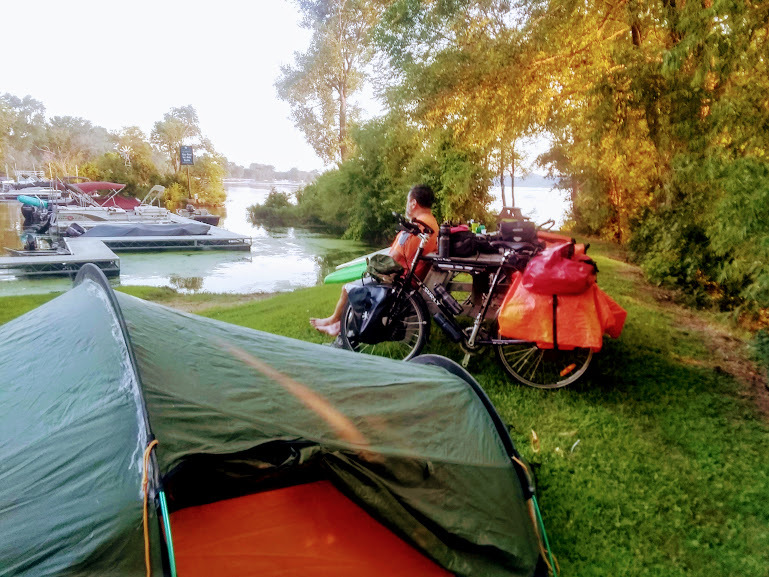 We managed to get a small campsite on the bank overlooking the campground’s small marina. 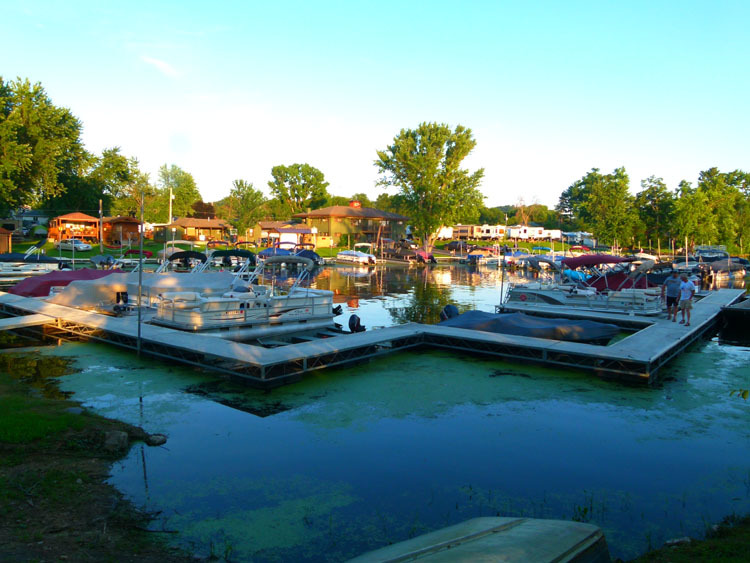 The marina was full of pontoon boats, a sight that had become quite familiar to us. It was getting on, so while I set up the tent, Sharyn went and got a takeaway dinner and some beers from the Thirsty Turtle, a small pub on the main street. They were so happy to see her, they even gave her two stubbie holders to put our beers in! As it went dark and we gratefully ate our dinner, the locals set off a prolonged round of fireworks, a sort of 4th of July hangover I guess. We watched on in amazement as fireworks rained down over pontoon boats and the fuel dock, nobody bothering to check the wind direction first. It would have looked like a scene from a Rambo movie had one little spark ignited. Well, we managed to avoid Armageddon last night and nobody got hurt. The fireworks were pretty good considering how small this place is. We headed out of town and joined up with the busy Highway 14 cutting through the city of La Crosse. 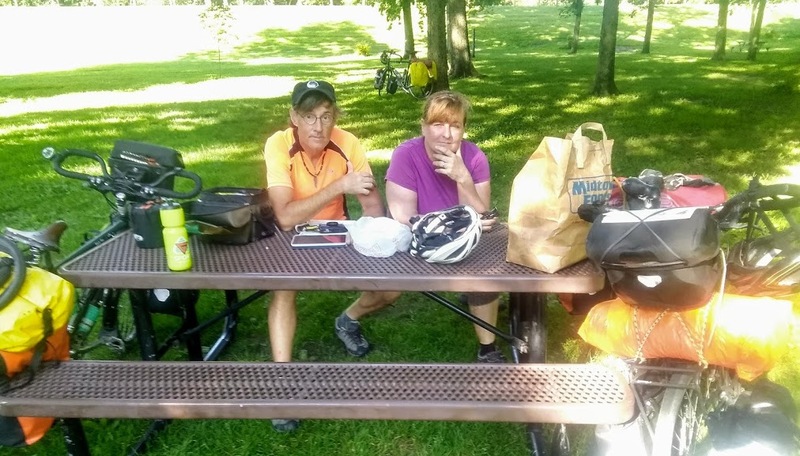 We stopped for a late breakfast at a gas station and threaded our way up to a bike path just north of Grand Crossing next to the Logan High School. 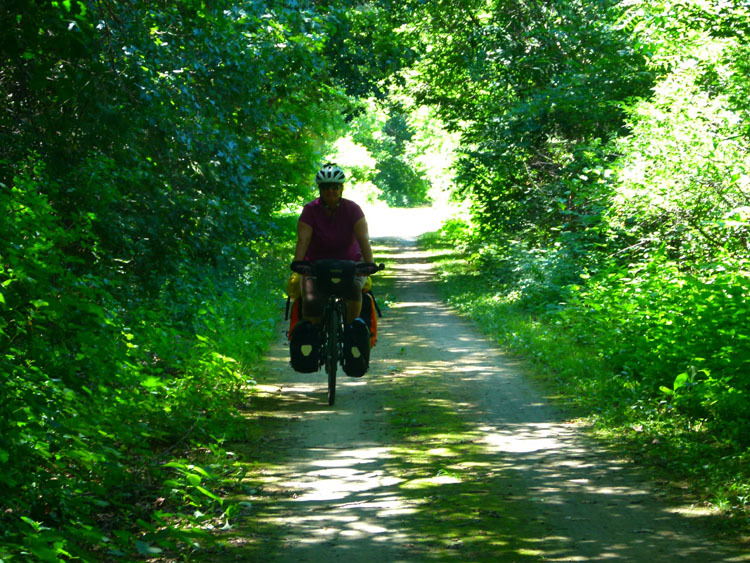 This took us out of the traffic and almost up to Onalaska where the Great River State Trail began. 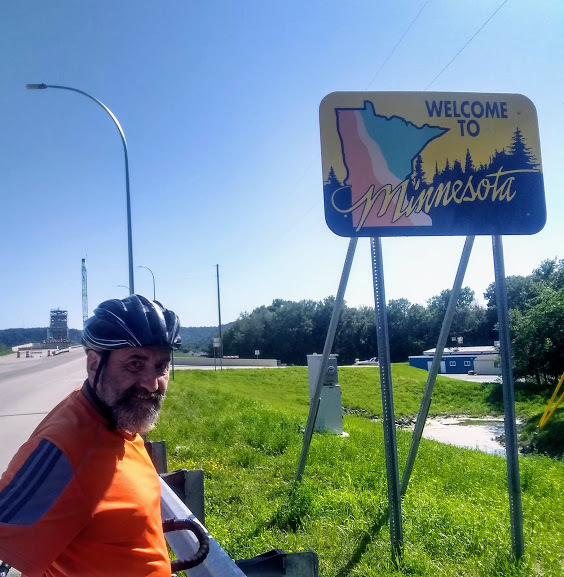 The trail is 23 miles (37kms) long and takes you up to Bluff Siding just down from the bridge which takes you over to Winona and into Minnesota. 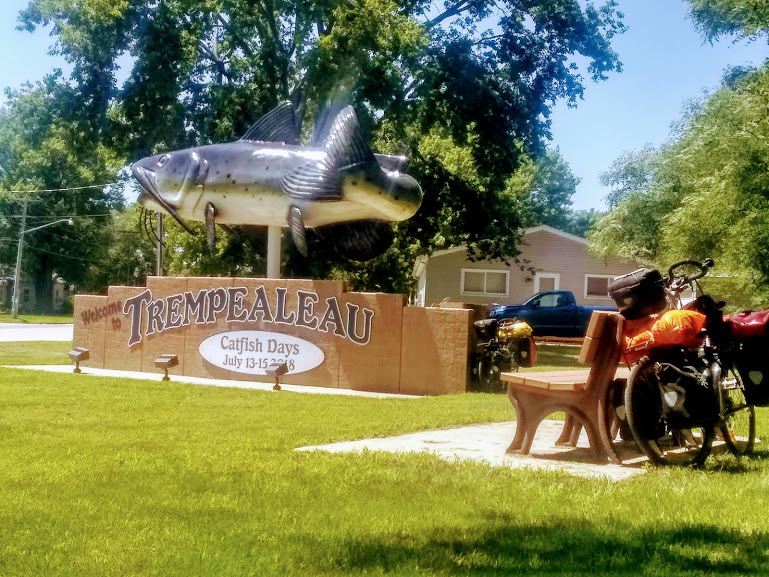 It’s an old rail-to-trail and goes via the town of Trempealeau where we took a break for lunch in a small, shady park at the town’s entrance on Highway 35. 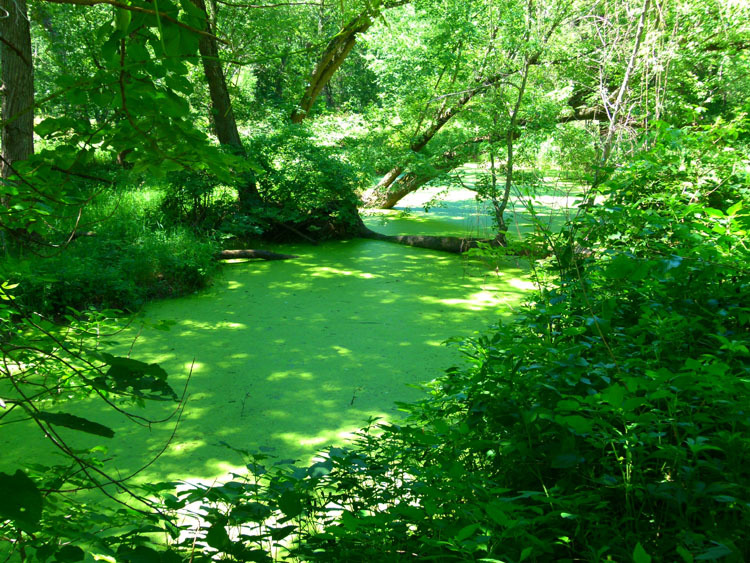 The trail navigates wetlands, grasslands and forests along its way, eventually crossing through the Trempealeau National Wildlife Refuge before meeting up with the 35 again. 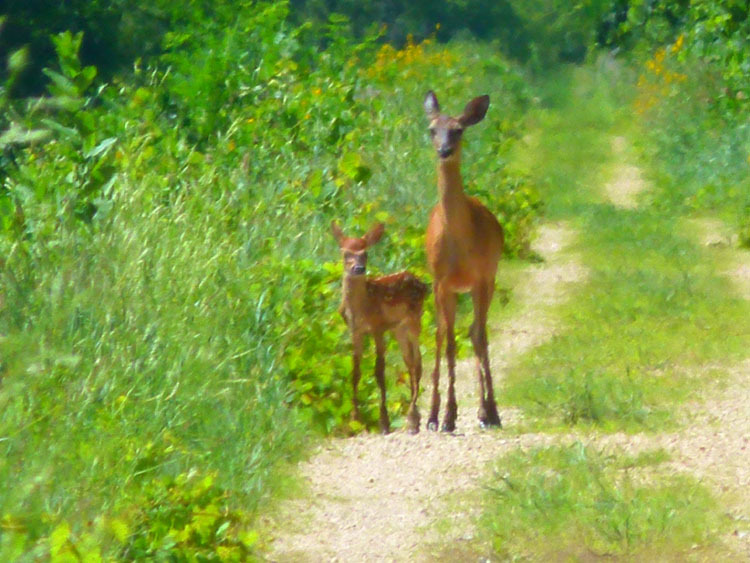 We did manage to see some deer, our only wildlife experience of the day. It was our longest trail yet and we were now pretty happy we’d chosen to ride on this side of the river. We were finally enjoying some shade again! 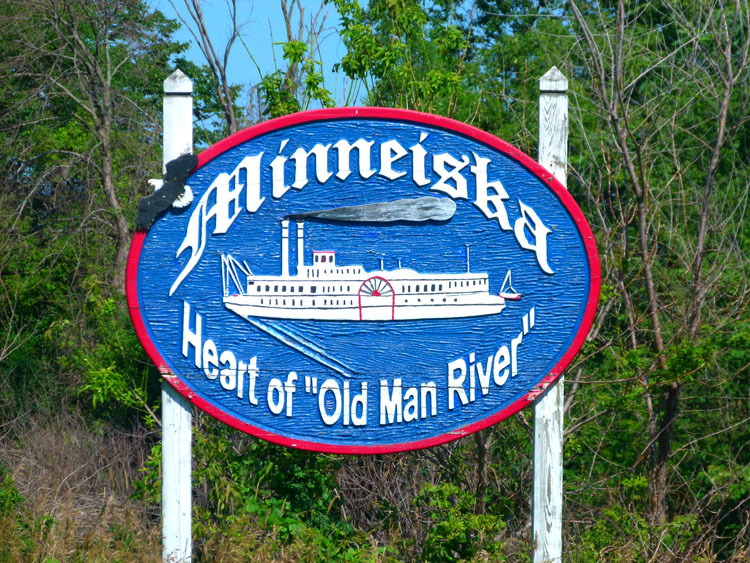 But it was soon time to cross back, as we came upon the bridge spanning over to the city of Winona in Minnesota. The bridge is long and crosses over a couple of islands in the river on its way to the far bank. It had a pedestrian footpath alongside the main span into Winona thankfully as traffic was pretty thick now. We found a young bloke on a bicycle who led us up to the local liquor store so we could buy some beers for tonight. Then it was off to the Prairie Island Campground for the night. It was a fair ride out of town but was a nice place and the new owner was very co-operative, even offering us a beer! Not long after setting up our tent (in the wrong place), we ran into Robert, an American guy who had stopped with our Warmshowers hosts Chris and Jodie in Rensselaer a couple of times. Jodie was now a Facebook friend and she had told us that he wasn’t far behind us. 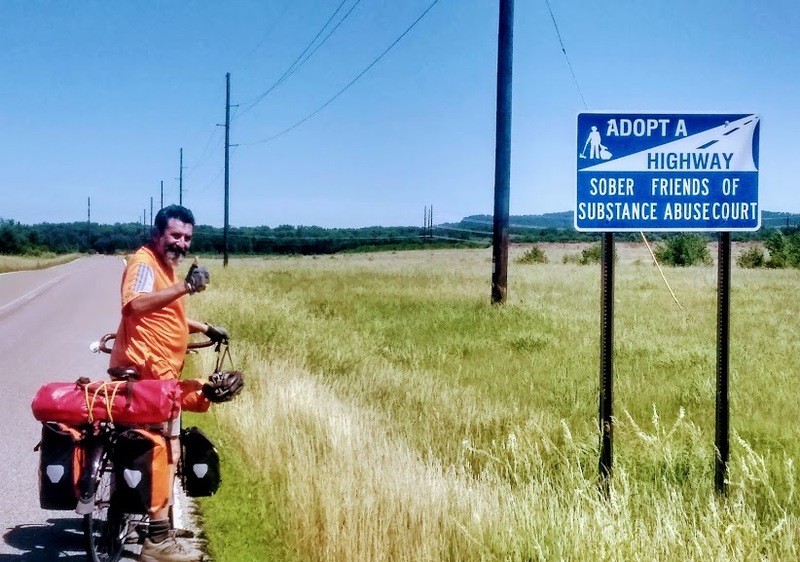 He was taking the same route as us across the States and would be much faster than us, an advantage as we’d be able to get first-hand information as to what lay ahead. That evening the park had organised a golf buggy parade for 4th of July. Almost everyone got about in golf buggies here and they’d all gone to a lot of trouble to dress them up for the parade. The main items of dressage were lights, and that made for a pretty nice sight as they snaked their way around the park throwing candy to everyone along the way – even us! I scooped up all the candy I could see in the dark and gave them to the family next to us who had two young daughters. Leaving Robert and the campground behind, we took the very quiet Prairie Island Road out to the 61. The highway was quite busy, but it had a wide, smooth shoulder that kept us out of harm’s way. We passed the entrance to the John A. Latsch State Park and smiled to ourselves. The entrance road rose steeply away from the highway and into the forest for some distance. We had considered staying there, but figured it would be too long a day yesterday. Good call, we reckon! Just after Weaver, we took the 84 to cross through some nature areas and enjoy the sudden lack of road noise out on this quiet road. By now though, the rather lumpy road was having an effect on us, especially me, as we hadn’t eaten any breakfast and I was beginning to bonk. The tiny town of Kellogg couldn’t have come fast enough and the Town and Country Cafe in the main street was just the ticket for a starving cyclist. We tied off the bikes out the front and went in for lunch. The cafe was full of older, local folks and once again, the talk was all about farms, crops, yields and the weather. 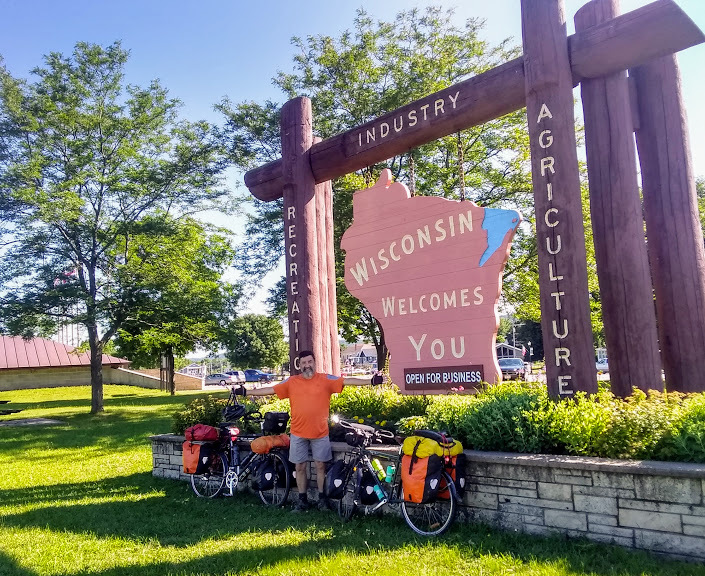 We were initially going to stop in Wabasha, just up the road from Kellogg, but now we were replenished, we decided to forge on up to Lake City. The highway passes the Bald Eagle Bluff Scientific and Natural Area and a viewpoint out over the river where Bald Eagles can be seen. 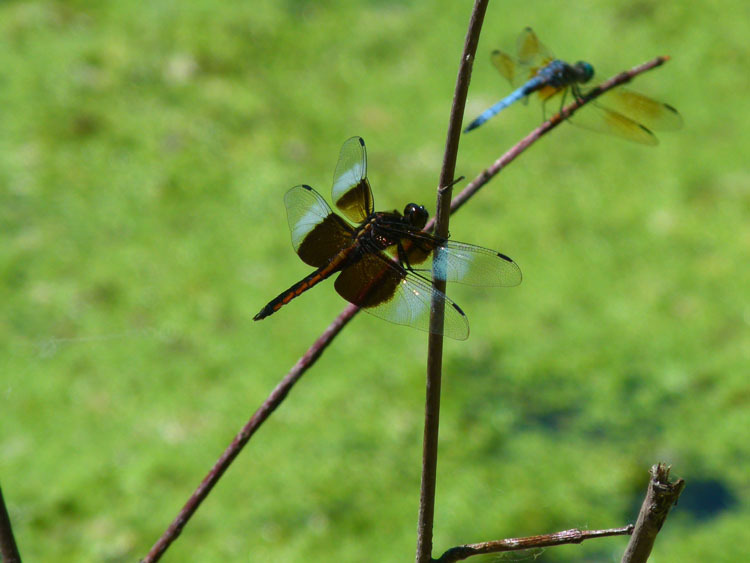 It was our lucky day, as we saw two of them circling around in the sky above us. 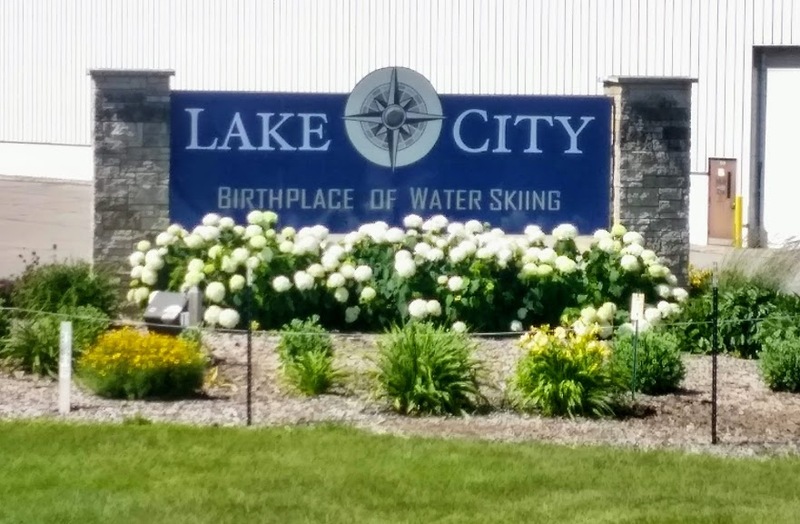 As we rode into Lake City, the welcome sign said, “Lake City, the birthplace of Water Skiing”. Whether this is true or not I’m not sure! We rode through town and up to the north end without spotting any campgrounds or liquor stores. After three long days in the saddle, we decided to stay in a room tonight and rest up. The Sunset Motel and Resort had a nice room across from the river and just down the road from the Willows on the River restaurant. 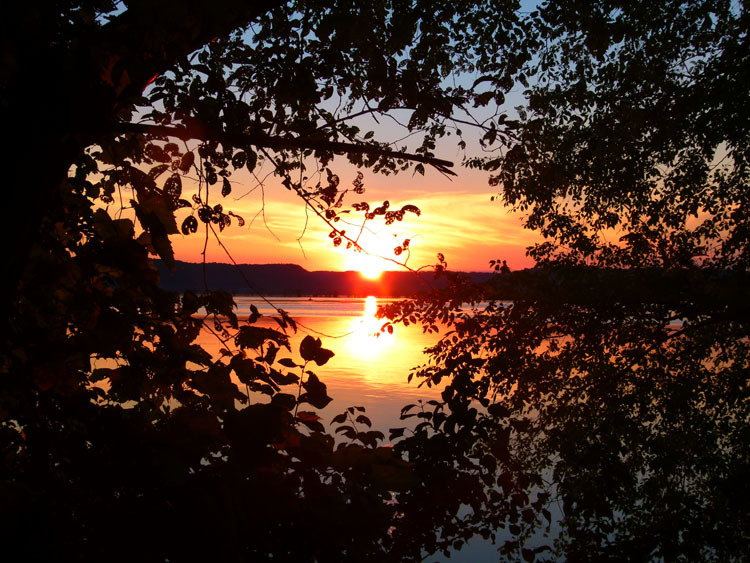 The wide expanse of river here in front of Lake City is called Lake Pepin, and Willows looks out over it and is a great place to have dinner and a few quiet craft beers while relaxing after a long day’s ride. 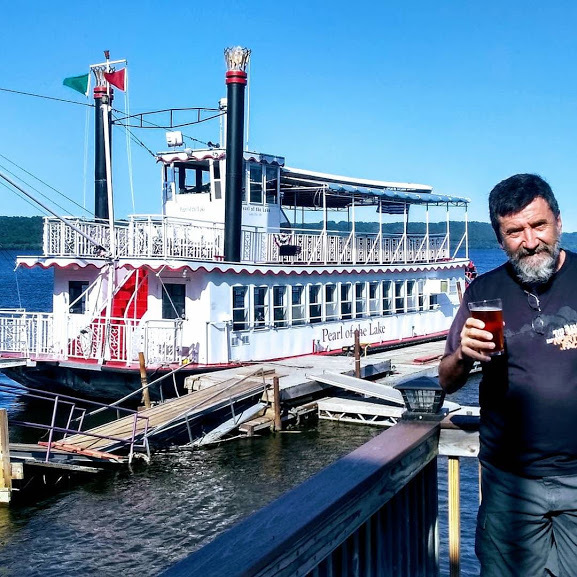 Lake Peppin paddle steamer and a craft beer – life’s good!